First FIFA World Cup to be held Europe since 2006. A total of 2.4 million tickets have been sold worldwide, with Russia allocated around 872,000. Russia was awarded the hosting rights on 02 December 2010 and later proposed 13 host cities and 16 stadiums, later reduced to 11 cities and 12 stadiums due to FIFA requirements. Of the 12 stadiums, five have been extensively renovated and the other seven stadiums have been built exclusively for the competition at a cost of $11.8 billion. All those travelling to Russia with official match tickets must also apply for a ‘FAN ID’ which acts as a multi-entry and exit visa. Those without official match tickets will still need to apply for a visa to enter Russia. Recent events globally have led to increased tensions at a political level between Russia and some of those nations taking part in the competition, including the UK and US. Security is expected to be extremely stringent around stadiums, fan zones and on public transport. Increased threat to the LGBT community remains a possibility despite reassurances from Russia’s Organising Committee. The 2018 FIFA World Cup football tournament is being hosted by Russia following a successful bid which was won in 2010. The first match is scheduled to get underway on 14 June at 18:00 local time (UTC +3) in the Luzhniki Stadium, Moscow and is between the hosts Russia and Saudi Arabia. The final of the tournament will be played on Sunday 15 July at 18:00 local time, again in the Luzhniki Stadium, Moscow. Altogether, 12 stadiums in 11 western Russian cities will be used to host a total of 64 matches involving 32 nations. The host cities are Moscow, Saint Petersburg, Sochi, Ekaterinburg, Saransk, Rostov-on-Don, Kazan, Kaliningrad, Samara, Volgograd and Nizhny Novgorod. Travel distances are vast, with 1800 miles separating the exclave of Kaliningrad on the Baltic coast in the west with Ekaterinburg in the east, the geographical borderline between Europe and Asia, located at the foot of the Ural Mountains. The event is expected to bring in hundreds of thousands of spectator fans with total ticket sales set at 2.5 million. Foreign nationals will require a passport with at least 6 months validity left on it and the passport must be in good condition. FIFA will once again operate their FAN ID system which allows registered ticket holders entry to the country without a normal visa for the duration of the tournament. FAN ID acts as a multi-entry and exit visa to and from Russia between 01 June and 17 July, however in order to access any of the host stadiums, you must have a valid match ticket, FAN ID, and your passport. Those without an official ticket will still be required to apply for a visa in the normal manner. Upon arrival in Russia, customs will issue travellers with a migration card at border control. The first part of the document is surrendered on entry, whilst the second part is retained with your passport until departure. A lost migration card is likely to result in travel delays and could also attract a fine. As would be expected at any large scale sporting tournament such as the World Cup, security is expected to be extremely tight. Additional security measures will be implemented under Order No. 202 of the Russian President dated 09 May 2017 and Russian Government Decree No. 689 dated 9 June 2017. Some of these measures include restrictions on hazardous production facilities, registration procedures on migration for Russian and foreign citizens, movement of vehicles, public meetings and the sale of weapons, explosive substances and alcohol. Similar security measures were implemented during the Sochi Winter Olympic Games in 2014 and the FIFA Confederations Cup in 2017, however given the geological challenges associated with the 2018 World Cup, applying the same level of security is going to be difficult. There are also a number of threat actors, with terrorism a significant concern, along with violent unrest between fans given football hooliganism is considered rife in Russia. Racism, homophobia and social intolerance are also issues which remain a concern. 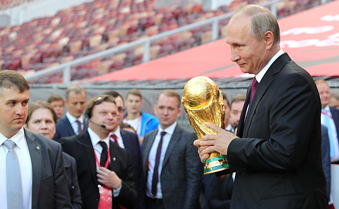 Although Russia has demonstrated it is capable of hosting major sporting events in the past, namely the 2014 Winter Olympics in Sochi and the 2017 Confederations Cup, potential security risks are heightened further for the 2018 FIFA World Cup. Not only are those fans attending the games facing the threat of terrorism, hooliganism, crime and even an insider threat posed by state agencies, the additional security measures designed to counter these threats are also likely to impact foreign travel in general. An increase in political tensions between Russia and some of the NATO members remains ongoing with the alleged nerve agent poisoning of an ex-Russian spy and his daughter in Salisbury, UK still fresh in the minds of the British authorities and their allies. International sanctions against Russia followed the poisoning claims amid a number of diplomatic expulsions by more than 20 western allies, including the US. However it is highly unlikely that Russia will use the games to carry out any form of ‘retaliation’ with the political scenario not expected to influence the games in any significant manner. The terrorism threat during the games is assessed as high. Both domestic and international terrorist groups pose a significant risk and despite a long history of dealing with major terrorist attacks, the capability of the Russian military, police and emergency services in the aftermath of a mass casualty attack is unclear. Within the last seven years, Russia has experienced a number of high profile terrorist attacks, carried out by both domestic far right groups as well as Islamist and rebel groups operating from the North Caucasus region. In 2011, 37 people, including a British national, were killed when a suicide bomber detonated a device in the arrival hall of Moscow’s Domodedovo airport. The bomber was later identified as coming from the North Caucasus. In 2013, three suicide bombings targeted public mass transport in Volgograd, two within 48 hours of each other. The first attack in October was carried out by a female suicide bomber with links to Islamic extremism. The device was detonated on a bus killing 7 passengers and injuring 36 others. The other two attacks took place in December 2013 targeting Volgograd-1 train station and a trolleybus, both involving suicide bombers with responsibility claimed by Vilayat Dagestan, a subgroup of the Caucasus Emirate, a militant Jihadist organisation. In total, 34 people were killed with many others injured. In October 2014, a suicide bomber targeted an event taking place at the town hall in Grozny. Police officers had challenged the bomber due to his suspicious actions; however the device detonated as he was being searched. Five police officers were killed and 12 others injured. Again Caucasus Emirate claimed responsibility for the attack. In October 2015, a Russian flight from Sharm el Sheikh in Egypt to St Petersburg crashed in North Sinai. Russian authorities stated the crash was caused by an explosive device on board the plane. The so-called Islamic State's Sinai Branch claimed responsibility for bringing down the aircraft, which killed all 217 passengers and seven crew members. In April 2017, a suicide attack on the St Petersburg metro resulted in 15 deaths and many injuries. The explosive device was contained inside a briefcase carried onto the third carriage of a metro train and detonated between stations. The suspect cited as being responsible for the attack was claimed as a 22-year-old Kyrgyz-born Russian citizen acting on the instructions of al-Qaeda leader Ayman al-Zawahiri. Russian intelligence and security services will be on high alert both in the lead up to the games and throughout the tournament. Islamic State has recently issued a number of threats directly aimed at the World Cup in Russia, graphically illustrated by a series of posters released by a French Islamic State-linked group and picked up by the terror monitoring organisation SITE Intelligence. Both Russian authorities and representatives from FIFA have confirmed unprecedented increased security measures are in place, aimed at minimising the risk posed by terrorist actors seeking to carry out a spectacular mass casualty attack. However, the primary threat is likely to come from lone or self-directed individuals who have been inspired by Islamic State propaganda distributed through their social media channels. Attacks of this nature are characterised by a mix of low-capability, minimal planning and the use of less sophisticated weapons such as knives, homemade IEDs or even vehicles. This poses an additional challenge for Russia's security services as they are hard to detect in advance given the limited communication necessary during the planning stage. Russian jihadists returning from conflict zones in the Middle East, who will likely have been skilled in handling a number of weapons systems, be capable of manufacturing crude IED’s from readily available materials, and have received military-standard combat training, could possibly pose the greatest threat. Together, Russia and the countries of post-Soviet Central Asia have seen more of their citizens travel to fight in Syria and Iraq than have any other parts of the world. Following the collapse of jihadist state in northern and eastern Syria, in part attributed to Russian-backed Syrian military offensives in Palmyra and the central Euphrates River valley, it is likely large numbers of fighters could be inspired to return to Russia, particularly given the opportunity to target the tournament. However, it will not be easy for these individuals to enter the country undetected by the Federal Security Service who are involved in ongoing counter-terrorism operations across the country. A secondary terror threat is also present in the form of insurgents operating in the northern Caucasus region, Dagestan and Chechnya in particular, also likely motivated by Islamic States’ calls for an attack targeting the World Cup games. The difficult operating terrain in Dagestan, Chechnya, Ingushetia, and Kabardino-Balkaria makes securing the region extremely difficult for the Russian security forces, especially in respect of carrying out successful operations against militants, who frequently respond with reprisal attacks. Stringent security measures are already in place and although not all have been divulged, many are aimed at countering terrorism such as a complete airspace closure around World Cup stadiums, severe restrictions in the sale of arms, knives and explosive material, and dedicated anti-terror para-military style police who will man vehicle checkpoints and patrol trains, planes and boats in large numbers. Violent disorder is another factor which poses a viable threat during the tournament. As was witnessed in Marseille during violent clashes between Russian and English fans at Euro 2016, Russian football hooligan groups are both well organised and very effective. Termed ‘Ultras’ in relation to their ultra-fanatical support, they have gained a worldwide reputation for violence and fighting across a long history of tournaments, which was brought to the forefront in Euro 2016. Despite reassurances by senior Russian police chiefs, the FIFA and the five eyes intelligence alliance have urged vigilance, particularly with regard to games involving the England team. This is exacerbated given the current heightened political tensions with the potential for anti-British sentiment even away from the game venues. Detectives from the UK will reportedly be in attendance at every England game carrying out intelligence gathering, alongside representatives from the British Embassy. Crime is not a serious concern in any of the cities hosting the games and as long as sensible precautions are applied, should not be a problem. Petty crime is more likely to be encountered, especially during the tournament as opportunist thieves take advantage of the mass influx of foreign nationals. Well-practiced scams have been reported although no more so than in many other Eastern European cities, the most common being the money drop scam in which perpetrator supposedly drops either money or a wallet in front of the target , who then instinctively picks it up but is then accused of stealing it. The sale of counterfeit tickets is also expected to be a common tactic to extort money by deception. The added complication with this is that you could be liable for detention if attempting to present a counterfeit ticket at a stadium. In general, public attitudes towards race and sexuality are less tolerant than would be expected in many other diverse countries and could manifest into negative displays of discrimination. FIFA takes a strong stance against racism and discrimination in any form and it is likely Russian authorities will want to promote a similar sentiment. Bear in mind the country is vast and although major cities such as Moscow and St Petersburg and likely to feel more liberal, attitudes will vary among Russian nationals and as a precaution it is strongly advised that you do not publicly display your sexuality or religious orientation. Before travelling ensure you have the correct documentation in place. The majority of international travellers visiting Russia will require a visa which must be applied for in advance, however those with an official World Cup match ticket can apply for a Fan-ID. You can enter Russia using your Fan-ID from 4 June until 15 July. You must leave by 25 July. An electronic migration card will be produced by border control upon entry into Russia. This comes in two parts; one part which is retained by the immigration officer checking your passport on arrival, and the other part which should be surrendered when you leave Russia. Travellers must register their stay in every host city within 72 hours of arrival. This is normally done by your hotel or guest house however it is your responsibility to make sure that this happens. Anticipate strict security measures throughout the tournament. This is also likely to impact travel in general with airspace, road, rail and sea restrictions in place. Expect to be asked for identification, or possibly even searched, by security forces in areas where there is high public traffic such as transport hubs, match venue’s and events linked to the tournament. Cooperate at all times and remain respectful when communicating with those in authority. Understand that photographing any military installation, government building or strategic site is strictly not allowed. This includes transport hubs such as airports and ports. Maintain a low profile as much as possible. Avoid getting involved with discussions on politics or religion. Travellers from ethnic minorities and LGBT communities are advised to exercise enhanced situational awareness, particularly outside of stadiums. Be conspicuous and aware of your surroundings and at all times. Host stadiums on match days will be attractive targets for opportunist criminals; however major transport hubs will also see an influx of travellers during the tournament and petty crime and could be targeted. Often criminals will work as part of an organised gang to maximise their efforts. Attempt to be as covert as possible when using mobile phones or laptops, and keep wallets and passports secure and out of sight. Keep on the lookout for scams, often involving several accomplices working together. Never pick up anything dropped on the ground, instead confidently continue walking and politely brush off attempts to get you to stop. Distraction techniques are also used to lure victims with requests for help. Be cyber alert. Public and hotel Wi-Fi connections may not be safe. Be wary of any IT related gifts such as USB sticks. It is safer to not plug them in and to discretely dispose of them instead. Remain vigilant at all times. Terrorists pose a credible threat. Report any suspicious activity or unusual behaviour to the authorities and if something does not feel right, trust your instincts and leave the area. Multi-lingual FIFA representatives will be on duty at every match and English speaking tourist police present in each of the host cities. Ensure you have comprehensive medical insurance in place prior to travel to Russia, including repatriation.